Get Formula 1 on Your Phone! The new season of the FIA Formula 1 World Championship is currently underway, with the teams travelling the world to embark on a series of Grand Prix to establish which driver and which constructor are the best this time around. With a massive international audience, interest in the sport doesn’t seem to have ever been greater, so it makes sense that you would expect to find a nice selection of apps for the sport on WP7. Naturally, there are quite a few to choose from, with some focussing on the sport as a whole, others offering trivia relating to the history of the competition and others still offering team-centric news and information. The following apps can all be found exclusively in the Windows Phone Marketplace. 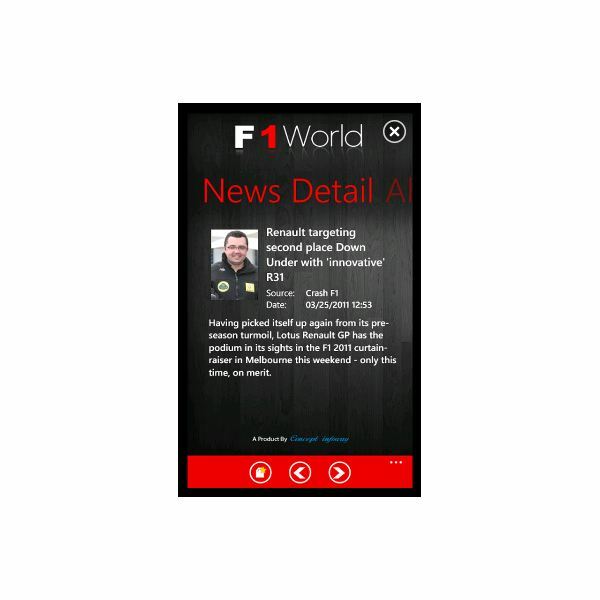 Probably providing more up-to-the-minute news and information than any other news-based Formula 1 app, F1 World is a free app that displays relevant updates from a combination of any of the big four F1 news sources, the FIA, Crash F1, ESPN and the BBC. This useful app displays summary information for each story, although the full details are launched in a browser window. If you’re looking for an F1 app that keeps you updated with all of the latest stories then F1 World should be your first stop, particularly on practice and qualification days! Dedicated to providing as much data as possible about the 2011 Formula 1 World Championship, F1 2011 Info features detailed information on all teams and drivers as well as a full race calendar, circuits visited and details of the current constructor and driver standings, updated after each race. Pretty much any information that you need to stay clued up with the season is included! 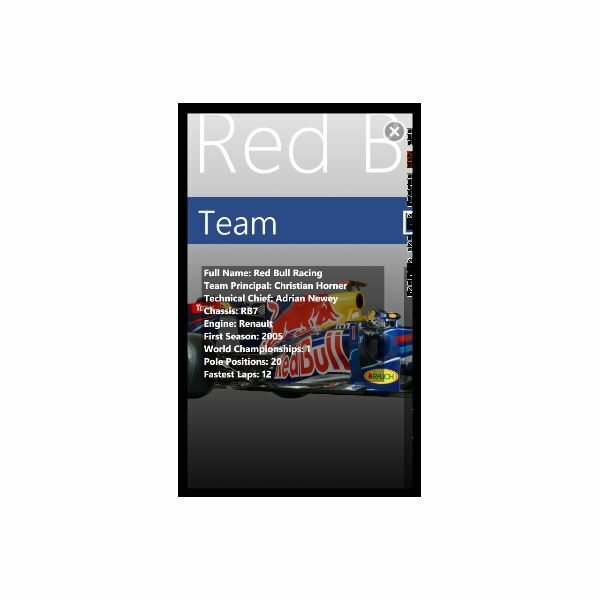 Available for 79p (UK price) this is a useful tool for any Windows Phone 7 owner who also happens to be an F1 fan. 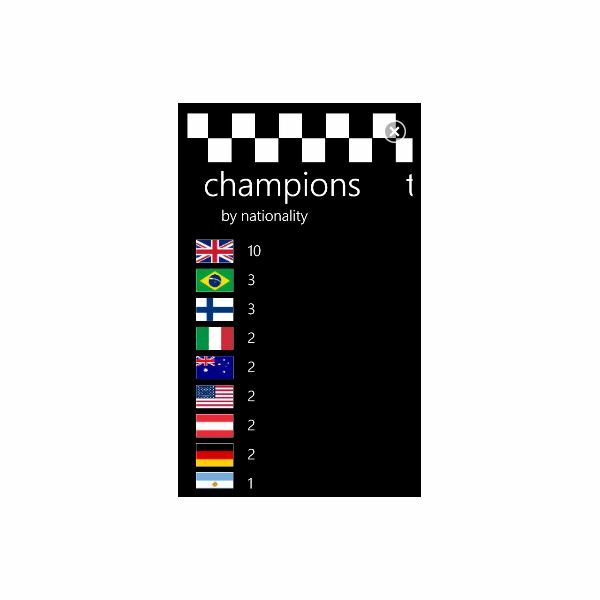 If historical statistics is your thing, the Formula 1 Champions app is available free and provides details of teams and drivers since the beginning of the World Championship. This free app features legendary names such as Ayrton Senna, Juan Manuel Fangio, Mike Hawthorn and many others and acts as a very useful, mobile reference book which is idea for checking details about the sport’s greatest drivers. In addition to the expected news and stats related apps, there are various team-centric apps available that focus on particular teams. These apps are free and very narrow in scope; fans of the Force India F1 team can download the Force India Fans app and get all of the latest news about that team and its results, for instance, and there are similar apps for McLaren, Williams, Ferrari, Mercedes-Benz, Red Bull and pretty much any current F1 team that you can name available on the Windows Phone Marketplace. If you want your Formula 1 app to show your team colors, install one of these!